Democrats have to weigh her role in torture against her strong backing in the intelligence community. WASHINGTON — Former CIA case officer John Maguire, who backs President Donald Trump, has almost nothing in common politically with John Brennan, the former CIA director who served President Barack Obama. But they both agree that Gina Haspel should be the next CIA director. As Trump's CIA nominee faces a Senate confirmation hearing Wednesday, it is difficult to find anyone associated with the nation's premier spy agency who doesn't speak well of Haspel, a career intelligence operative who would become the first woman to lead the CIA. The problem is getting them to explain exactly why, given that Haspel spent almost her entire tenure spying undercover. The details, it seems, are classified. The praise, by contrast, is plentiful. "In Gina we have somebody who has done the hard work abroad and done the hard work in Washington," said Frank Archibald, the former head of the CIA's operations arm, who rarely speaks to reporters but is responding to nearly every inquiry about Haspel. "Gina keeps her word, and people can trust in what she says." The strong support for Haspel in the American intelligence community is a powerful factor weighing on Democrats who say they are undecided about her nomination, congressional officials tell NBC News. In Haspel, they believe they would get a nonpolitical, career public servant whose former colleagues say she would stand up to Trump if he asked the CIA to violate American values. Haspel visited some of those Democrats on Capitol Hill on Monday, including Sens. Joe Manchin of West Virginia, who may well vote for her, and Martin Heinrich of New Mexico, who later said he would not. The big question is whether the push from the intelligence community can overcome the revulsion that several senators have expressed over Haspel's role in brutal CIA interrogations after 9/11. "Those of us who worked on the torture report know some things," Sen. Dianne Feinstein, D-Calif., who spearheaded an exhaustive 2014 Senate report on the CIA's interrogation program, told NBC News. "They're classified. And this is an important part of this woman's career." As NBC News has reported, Haspel was sent to Thailand to run a secret CIA prison — a black site — where a detainee was waterboarded three times and confined to a small box. A few years later, she drafted a cable — later sent by her boss, Jose Rodriguez — ordering the destruction of videotape of all CIA interrogations. The CIA's lawyers had urged that the tapes be preserved, and Rodriguez was reprimanded for the order, though Haspel was not. "At a time in which we're seeking to rebuild our alliances with Europeans and other governments around the world, to elevate someone who was so intimately involved in torture would send the exact wrong message," said Raha Wala, senior counsel for Human Rights First, which opposes the nomination. More than 100 retired generals and admirals said in a letter that they were "deeply troubled" that somebody connected to torture would be picked to lead the CIA. "We devoted our lives to the defense of our country. We know that fidelity to our most cherished ideals as a nation is the foundation of our security," the letter reads. "It would send a terrible signal to confirm as the next director of the CIA someone who was so intimately involved in this dark chapter of our nation's history." Signatories include former Joint Chiefs Chairman Gen. Hugh Shelton; former Marine Corps Commandant Gen. Charles Krulak; Vice Admiral and former Surgeon General Richard Carmona; and Maj. Gen. Antonio Taguba, who wrote an internal Army report on detainee abuse at the Abu Ghraib prison in Iraq. Haspel is expected to say publicly Wednesday what she already has told senators privately: That is if she has anything to say about it, the CIA will never again engage in brutal interrogations. "I want the American people to know who this nominee is and what her role was during this important period," Sen. Ron Wyden, an Oregon Democrat, told Andrea Mitchell Monday on MSNBC's "Andrea Mitchell Reports." 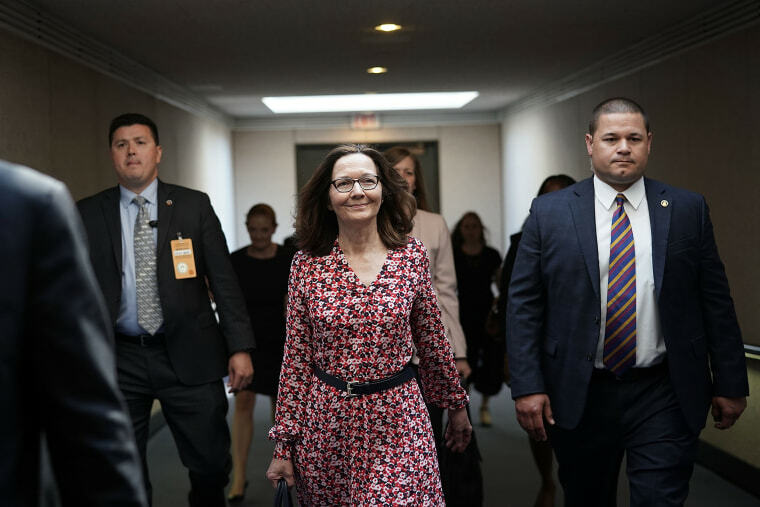 The focus on the torture issue frustrates Haspel's many admirers among current and former CIA officials. They argue that her background makes her perfect for the job. She would be the first operations officer to lead the spy agency since William Colby in 1973, a fact that has deep resonance among fellow operations officers, who do the spying in the field for the CIA. "She grew up in the directorate of operations. That is what we do: Recruit spies, steal secrets," said Daniel Hoffman, a retired CIA operator who worked closely with Haspel. "You want a carpenter to be the CEO of your furniture factory. She knows the patois, she knows the recruitment cycle. We've had some good directors and some less good directors, but they've never actually recruited an agent. Gina has." Maguire, a Trump fan who helped run CIA operations during the post-invasion period in Iraq, said Haspel "has stepped up and volunteered for the hard jobs, even when it wouldn't benefit her career." And she became a pioneering woman at the agency, friends say. "Over the years, particularly the Directorate of Operations — the DO — was an old boys' club," said Carol "Rollie" Flynn, a retired CIA operations officer who worked with Haspel. "In many ways, it still is. But despite that, she rose. She did really magnificently, and a lot of that is because she's super hardworking, super ethical." Based on the limited information the CIA has released and some other reporting, it's known that Haspel began her spying career in Africa. Public records show an address for her in Addis Ababa, Ethiopia. U.S. officials told NBC News she played a role in an operation that led to the capture of two terrorists who helped carry out the bombings of U.S. embassies in Africa in 1998. In the late 1980s, as the Wall Street journal first reported, Haspel had a memorable interaction with Mother Teresa. She was working weekend duty, U.S. officials said, when the famous nun asked to speak to President Ronald Reagan about wheat shortages in the African country in which Haspel was based. Haspel invited her to the embassy, a phone call ensued, and later Haspel was invited to visit Mother Teresa's orphanage. In another anecdote conveyed by her supporters, she is said to have been shot at by Iranians while hastily leaving a clandestine meeting in an undisclosed country. Public records also show an address for her in Ankara, Turkey, and the CIA says she is fluent in Turkish and Russian. According to her declassified resume, she was deputy group chief for Russian operations in the CIA's Central Eurasia Division from 1998 to 2000. She helped run the CIA's operations arm and was the station chief in London before being promoted to deputy director of the agency under Mike Pompeo. After Pompeo was confirmed as secretary of state, Haspel became acting CIA director. Friends say Haspel, 61, has devoted herself to a series of demanding jobs. The circulation of bland job titles and favorable stories, in the absence of any information about intelligence misjudgments or operations gone wrong, has rankled critics who say the CIA has mounted a propaganda operation to boost Haspel's chances. "There's been selective declassification of her record, and there's been a public influence campaign," Wyden said. "This lack of transparency for the American people about someone nominated for a cabinet-level position is unacceptable," Sen. Mark Warner of Virginia, ranking Democrat on the Senate Intelligence Committee, said in a letter Monday. White House officials expressed confidence Monday that Haspel would be confirmed. Democrats weren't so sure, but they acknowledged that one factor is a fear that whoever Trump nominates next wouldn't be nearly as well qualified. Or as well positioned to resist an ill-considered order from Trump. If Trump ordered the CIA to torture, "she'd be the one to argue (against) it, because she could say, 'Listen, Mr. President, I actually went through this before. Let me tell you how it went down. And I can tell you, because I saw it — right up close,'" said Hoffman, her former CIA colleague. "And so, and it may be counterintuitive for some, but she's actually the best person — better than any I could imagine — to explain this to the president. And to our oversight committees as well. Because of her experience."